I purchased this machine a few years ago to use as a 'spare.' and as a pure DOS machine. I use the old BootMagic™ program as a boot manager, and have true DOS (MS 6.22) and Windows 3.11 in one partition, WIN98 (the native OS of the machine) in another, and Debian Etch (booting from LILO installed in the logical partition, because BootMagic™ doesn't like GRUB) in the third. I'm using various Linksys WPC11 version 1 for 802.11 connections, and sometimes a 3COM PCMCIA ethernet card for a hard-wired connection. In recent months the mousekey equivalents on the trackpoint device have failed and I'm required to use an external mouse. This is true on all OS versions, so I'm sure it's a hardware issue. Oh and I 'accidentally' bent some pins in the 2d PCMCIA slot. Ah well, it is old. Otherwise, this is a familiar old workhorse of a machine, and many people have successfully loaded many different distributions of Linux on it. The latest (as of early '06) Debian Etch netinst CD gave me a fairly straightforward install, and the latest XOrg xserver works fine out of the box. Probably the toughest nut to crack is the sound card, and of course the modem, which is of little use in any event. The Neomagic sound card is, well, problematic for most Linux distributions. You'll find extended discussions and work-arounds elsewhere, but the short story is that he OPL3SA2 drivers work, and in Debian etch alsaconf offers you the choice of using them. Now if your applications don't support ALSA, well, that's another story. 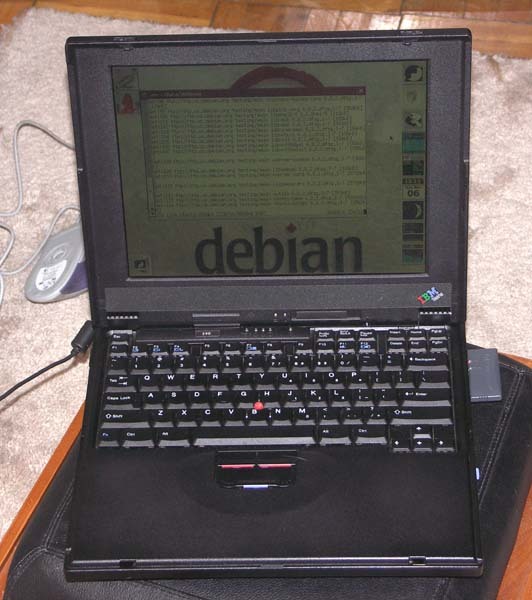 Until recently I ran Debian Sarge on this machine, but an OS related issue is that under Sarge the system seemed to slow down to a virtual halt after a couple of hours of use, with the CPU spiking to 100% and staying there. This really is a seldom-used system, so it didn't matter much to me. But recently, a quick web search revealed that this was a known APIC issue with older kernels, so I upgraded to Etch on a 2.6.16 kernel, and APIC seems to be more reliable. Course, I'm stuck now on 2.6.16, because my experience with my newer Thinkpad 570 scares me away from the latest Etch kernel and it's UDEV problems. ACPI: PCI Interrupt Link [LNKC] (IRQs 3 4 5 6 7 9 10 11 14 15) *0, disabled. ACPI: Embedded Controller [EC0] (gpe 9) interrupt mode. piix4_smbus 0000:00:02.3: IBM Laptop detected; this module may corrupt your serial eeprom! Refusing to load module! nm256: no ac97 is found! or try sb16 or cs423x drivers instead. eth0: Station name "Prism  I"
pcmcia: Detected deprecated PCMCIA ioctl usage. pcmcia: This interface will soon be removed from the kernel; please expect breakage unless you upgrade to new tools. pcmcia: see http://www.kernel.org/pub/linux/utils/kernel/pcmcia/pcmcia.html for details.